So, Phil… And T for that matter… Whatever happened to “Sketchies” anyhow? Though if I had to pick one, I guess I’d take “Guilded Age”. 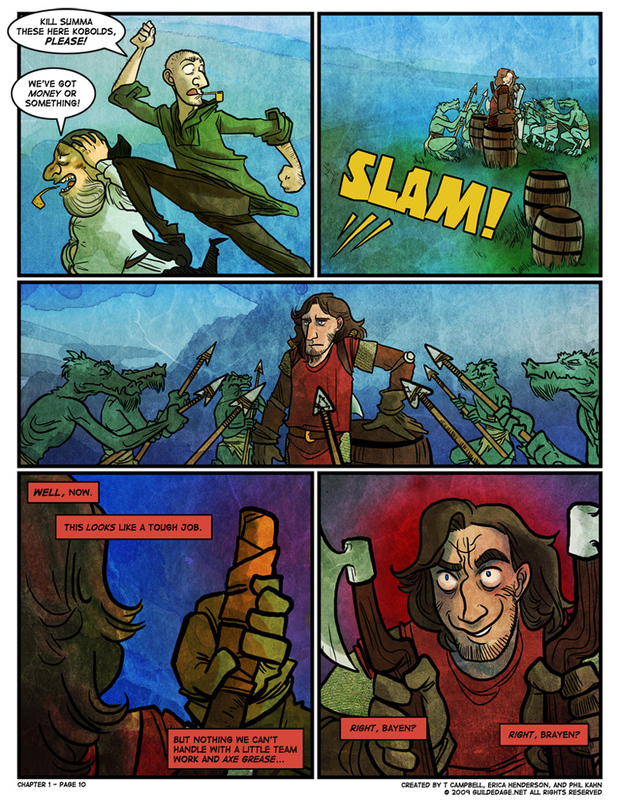 Not that the world necessarily needs yet another humorous webcomic take on epic fantasy, but… this seems a particularly good one thus far. The “Where is Sketchies” question will hopefully be answered soon, and that’s the best I can give you right now. Not that I ever asked said question myself… but I applaud your use of the webcomic guy’s rote answer in the context of a question to which it seems curiously mismatched. This is whether or not you meant so for the sake of humour or not. I can never quite tell whether some things are meant to be funny or not. One might say that true humour lies at the point between irony and sincerity where the two become nigh indistinguishable. One might say it, but then since I just said it, that would be redundant… no? I just wanted to say… This is probably my favorite webcomic so far, that I’ve ever found, ever. The art is amazing, and looks very well done, like a mix between Penny Arcade and Little Kitten Teeth, and the writing is much better than anything I’ve seen in a webcomic so far. I’m very happy you guys exist. Keep ’em coming! Yes it is very good! I’m rereading the archives to try and catch all the little things I missed before. That and it’s such a good webcomic. Reading archives, because it’s good, and because…chapter nine. Think, when this page first came out, we may have thought that THIS was him about to berserk! Silly, right? Is this old enough for any part of it to be considered “classic”? Also re-reading, for the sheer epic awesomeness of it. Spoiler alert: This comic is full of epic awesomeness. Or not, if you don’t like the sort of things that go on here. It’s good to re-read now and again, refresh the plot. Crack even sillier jokes. Last panel… +10 to Intimidation check! So… “baying” and “braying” with novelty spelling, yes? Or am I completely off? No, you’re correct, i believe. A rather unpleasant RP character I used to have had two swords called Manchar and Murchar. I had a bit of a fascination with Portuguese at the time. For some reason they’re among the weapon names I’ve been most chuffed with.